Cutting the Founders' Day cake are, from left, Stephan Lally, President of SGA; Ramapo President Peter P. Mercer; Susan A. Vallario, Vice Chair, Board of Trustees; William F. Dator, Chair, Board of Trustees; and Karen Aguirre, Student Trustee. 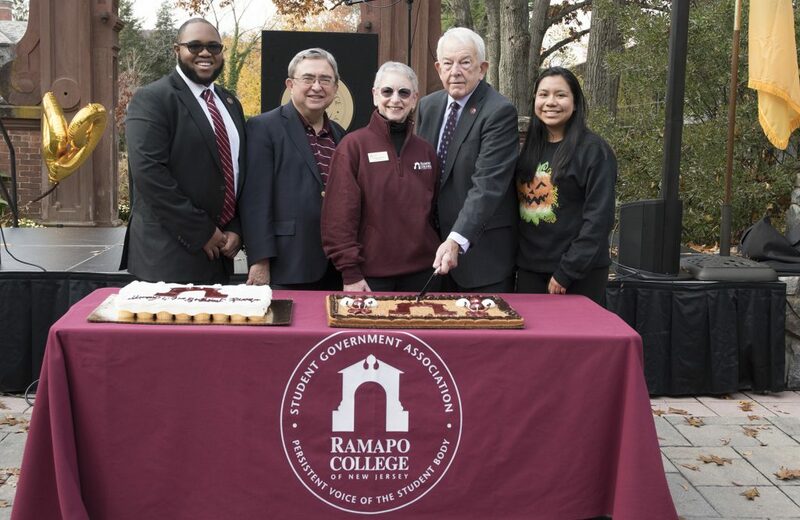 MAHWAH, N.J. – Ramapo College of New Jersey celebrated its 49th birthday during a celebration of Founders’ Day on Wednesday, November 7 at the historic Havemeyer Arch and in the campus Grove. The event was sponsored by the Student Government Association and the Office of the President.